Japanese artist Kitagawa Utamaro (1753-1806) was one of the most influential artists working in the genre of ukiyo-e, pictures of the floating world’, in late eighteenth-century Japan, and was widely appreciated for his prints of beautiful women. In 1804, at the height of his success, Utamaro published a set of prints related to a banned historical novel. The prints, entitled Hideyoshi and his Five Concubines, depicted the military ruler Toyotomi Hideyoshi’s wife and concubines, and consequently he was accused of insulting Hideyoshi’s dignity. He was sentenced to be handcuffed for 50 days, and was perhaps even briefly imprisoned. According to some sources, the experience crushed him emotionally and ended his career as an artist. In this book, Julie Nelson Davis draws on a wide range of period sources, makes a close study of selected print sets, and reinterprets Utamaro in the context of his times. 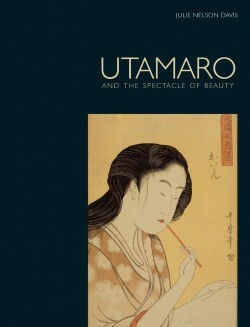 Reconstructing the place of the ukiyo-e artist within the commercial print market, she demonstrates how Utamaro’s images participated in a larger spectacle of beauty in the city of Edo (present-day Tokyo). Offering a new approach to issues of the status of the artist and the construction of gender, identity, sexuality and celebrity in the Edo period, this book is significant contribution to the field, and will be a key work for readers interested in Japanese arts and cultures.